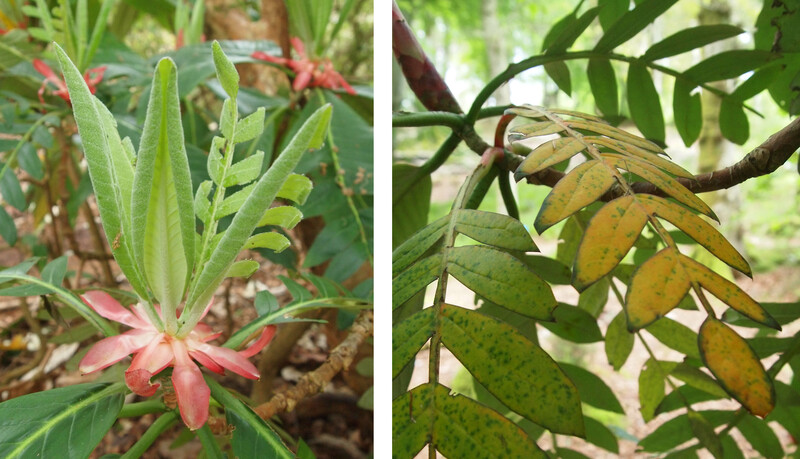 The rhodi’s are growing, the terminal buds opening into leaves – not the flowers I had anticipated. The pink tip opens to momentarily form a crown of ‘petals’ around the pale soft baby leaves within. I cut some. The phrase ‘kill your babies’ flits through my thoughts as I ruin the downy surface with clumsy fingers and watch sap tearing along my rough cuts, a disturbing experience and yet curiosity drives me on. Beneath the trees older leaves have already fallen, one white, another bright yellow, the cut shape more startling off the tree than on it. This entry was posted in Uncategorized and tagged Artwork, Bud, Colour Choice, Curiosity, Cuts, Growth, Leaves, Nature of Change, Petals, Rhododendron, Trees. Bookmark the permalink.